UTSA professor Richard Hartley specializes in the administration of justice, namely decision-making practices surrounding criminal court processes. (April 12, 2017) -- Richard D. Hartley is a professor in the UTSA Department of Criminal Justice who specializes in the administration of justice, namely decision-making practices surrounding criminal court processes. His research has been funded by federal and local agencies and by private foundations such as the National Institute of Justice, the Bureau of Justice Statistics, the American Statistical Association, the Texas Access to Justice Foundation and Bexar County. 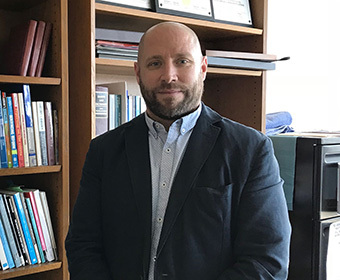 We sat down with Professor Hartley recently to learn more about his international collaborations and the outlook of the criminal justice industry. What’s exciting you the most these days? I am very excited that I am at a stage in my career where I have had some time to engage in original data collection on several projects as well as engage with other scholars outside the United States on international collaborations. For example, I have worked with international colleagues to administer a social science survey to university students in the United States and Malaysia regarding cultural and demographic differences in involvement in crime. I have also collected data on judicial sentencing decisions for convicted drug traffickers in one provincial court in Spain and presented findings from my research in Colombia, Canada and Scotland. Currently, I am involved in a federally funded, mixed-method evaluation of veterans treatment courts (VTC) that involves court observations and in-depth interviews with participants across eight VTC programs in three different states. Having the time and opportunity to collect original data allows for exploration of research questions that most often cannot be answered by using government, or other official, data sources. Finally, international collaboration allows for exploration of different approaches to crime and justice and offers a unique perspective in how to examine future research questions. I hope that my research findings have advanced our understanding of the correlates of court decision-making practices and uncovered contexts in which decisions at earlier stages (bail, type of attorney, prosecutorial charging and bargaining) have the potential to condition formal legal outcomes. The research questions my colleagues and I investigate concentrate on exploring and uncovering disparities in sentencing practices, with a focus on individual decision-makers such as prosecutors and judges. Theoretical developments in courtroom actor decision-making have utilized a wide range of perspectives, and the majority of existing studies have regressed case and defendant characteristics along with process variables on sentencing outcomes, mainly the decision to incarcerate and the sentence length decision. As such, my research is theoretically grounded and attempts to more fully understand and advance explanatory models of court processes and decisions. In recent years, my co-authors and I have also employed multi-level, multivariate, models to tackle several conceptual and methodological issues that have not been fully explored in previous sentencing research. These studies have attempted to more fully operationalize empirical tests of contemporary theoretical perspectives. Finally, I have also attempted to bridge theory and practice through evaluation research aimed at establishing evidence-based findings to inform criminal justice system policy and practice. I am a first-generation graduate who grew up on a farm, so I understand the value of a good work ethic. I believe that hard work and dedication is the key to achieving your goals. Thomas Edison said that success is 10 percent inspiration and 90 percent perspiration. I think about how hard my parents and grandparents worked to provide a better life for their children, and that makes it very easy for me to go to work at an institution of higher education every day and try to make an impact through teaching and research. What is the one thing going on in your field that nobody’s talking about? Research on crime and justice is rapidly becoming more interdisciplinary. I think that we are not yet fully aware of the potential this can have for advancing our understanding of crime etiology and the data it may provide to inform adoption of more effective criminal justice system responses. Having said that, I think that there is not enough discussion of the scientific rigor of some of these recent studies. If cross-disciplinary studies are not including relevant variables that have been empirically supported by existing criminological research, the conclusions from them are meaningless. I always emphasize the concept of GIGO (garbage in, garbage out) to my students; if you put garbage into statistical models, you get garbage out! What do you think is the biggest challenge researchers in your field are facing? In the last decade, the general public has been more supportive of smart solutions to crime prevention and the administration of justice, but the powers that be are still beholden to special interests. Therefore, we do not always implement smart policy or programs that will have long-term community benefits. Instead, we opt for quick fix or myopic solutions that continue to give us the same result and end up costing taxpayers more money in the long run. This historical amnesia is not the case in every jurisdiction across the country but, in general, characterizes crime and justice policy at the national level. What would you say to a student who is interested in entering your field? Honestly… Forget everything you think you know about criminology and criminal justice. Chances are that this knowledge was acquired from television crime dramas or the local news which presents a distorted view of crime and misrepresents the criminal justice system. If you want to examine phenomena in crime and criminal justice, you need to learn how to think critically about them. UTSA has recently focused on enhancing students’ skills in analyzing and interpreting data thereby enhancing the use of logic, reason and inference in decision-making. Increased quantitative literacy can make students better consumers of information and more valuable employees regardless of the field in which they choose to work. Criminology and criminal justice involve gathering information from multiple sources. If you want to move up in the field, you are going to need to be adept at collecting, interpreting and utilizing factual information to make decisions. Learn more about Richard Hartley. Learn more about UTSA College of Public Policy.